I write to you from the Fiji Islands. I know. I’m a lucky bugger. I would say, “wish you were here” except that pretty much everyone appears to be here already. Which is great of course because we all want to holiday where the rest of Australia is holidaying, don’t we? Australians, in general, are such becoming and personable travel companions after all. Especially when there are buffets and pewlside lounges involved. I sound like a snob. Dammit I am a snob. But I mean it when I say I’ve acclimatised. Adjusted might be a better word. I’m embracing the familial closeness, the togetherness, even though a family room for twelve nights is at times a little bit too together and I have to pretend to be constipated to get some extended alone time. I’ve also been to the laundromat for an hour with a load of washing and my book. It was warm, fresh-lineny, swishy-swashy bliss. (8 days later) Ok I’m back, I’m on a small Fijian Island now and far more relaxed. It’s been difficult to write to you, for a number of reasons, mostly because my usual writing time – evenings when everyone is asleep, has been encroached upon by the family room thing and having to go to sleep at the same time as the kids. As a result, I’m well rested and well read (three books so far), but I have realised how flaccid and flabby I feel without some daily writing exercise. Fiji has had four coup d’etats (seizures of power) in 27 years. Essentially Fiji is meant to be a democracy, but it is a fragile one, dependent on the flights of fancy of only a few individuals. The Fijian Islands’ political instability stems from tensions between the indigenous Melanesian population (the majority – 57%) and the Indo-Fijians (38%), who are descended from Indian labourers brought to Fiji in the late 19th and early 20th centuries. The most recent coup was in 2006 when then military Commander Frank Bainimarama overthrew the Government, partly because of land rights bills favouring indigenous Fijians over Indo Fijians. While Fiji does hold elections, it has been said that the results will continued to be tweaked in Commander B’s favour, although his 52% win in the last election was scrutinised by international overseers and deemed valid. Frank also has control over the country’s media, so yep, wobbly democracy. Ouch, enough brain activity, I’m exhausted, but I’ll push on because I only have limited time before husband and kids finish their coconut hunt. Anyway, Fiji time, yep, the Fijians tell you off for rushing, and sometimes I feel affronted to be asked to find a snorkel. It’s faintly worrying to the usual ‘must be productive’ me, but mostly very bloody nice vinaka very much. 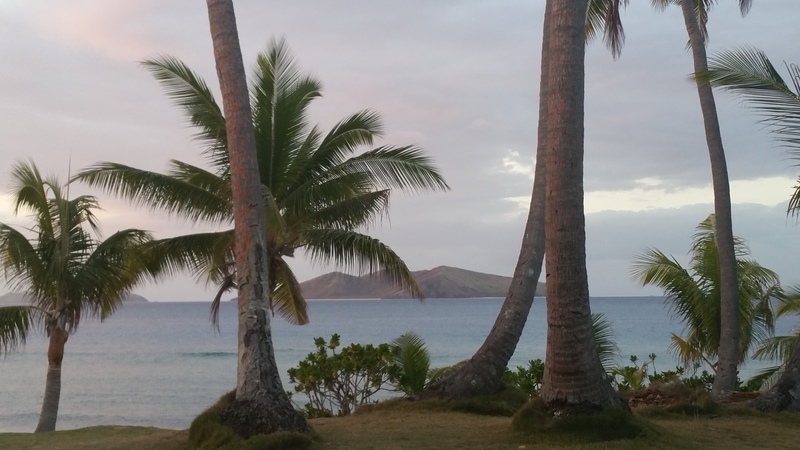 (I’ve learnt three Fijian words – vinaka (thank you), bula (hello) and vonu (turtle, also the brand of the local beer). 1) This is not the intrepid and culturally enriching holiday that I wish I could report on. The kind that would exercise my brain as well as my legs, arms and liver. The kind that an interesting blogger would blog about. But fuckit that’s not me at this present, parent stage of my life. This is the package deal, meal and transfer inclusions, pool bar, kid’s club type of holiday. The kind of holiday I would pretend not to like if I was talking to say, Brad Pitt or the Queen. It’s a food court, shopping mall kind of holiday, with buffets. My dear late Granny would be horrified. But buffets, I’m over them, they can take their dinner rolls and their flaccid sausages and shove them up their soggy toasted bumholes. Buffets bring out the very worst in humankind. The other day I saw an oversized Australian woman snap at her husband, “I said get me a hash-brown”. I looked at her floundering husband and thought, “She doesn’t need any more hash-browns dude, get the mole some lettuce”. My children are like small starving warthogs around the buffet. My years of teaching them by example the merits of a balanced diet get scuttled out the window when you can get toast and chips for dinner. And pink syrup that smells like strawberry shortcake dolls. Manners are apparently not allowed anywhere into the cafeteria-style restaurant, there is clearly not the time for them when there is racing to the jelly station to be done. Wastage though, as in plate-loads of stuff shunned by small people with eyes bigger than their stomachs, is entirely acceptable. The whole thing leaves me feeling like a fat, white, entitled person. Contiki people all grown up (and out). The lettuce wilts and the very walls of the slightly fatigued resort seems to emit a disappointed groan at the sight of more peeling pink people yelling at their kids beside the cocopop dispenser. I do, however, quite like those weenie cocktail onions at the salad bar, so perhaps I’m a closet buffet bogan. 2) I’m a proper, rubber-necked tourist flaunting my developed-country attitudes in a developing country. We did a village tour. I am glad I did but I was uncomfortable the entire time. I, like many other privileged whiteys before me, felt it would be good for my spoiled brats to see how other people live – in tiny houses with their entire extended family and no power. We sat in on a kava ceremony. While they mixed the powder and raised their voices in (I guess) a prayer of sorts, I prayed silently that they wouldn’t offer me any. They did of course. It took all my strength not to grimace after drinking that bitter beige fluid. Another second or two I couldn’t grimace anyway because my mouth went numb. We danced then. A handsome young villager took my hand and we danced a sort of awkward waltz. He asked me my name. I wished I could have said something becoming, like Amelia or Rosaline. ‘Meg’ is such a disappointing thud. He told me his name was Happy. I wondered, as his womenfolk cleared our dishes, whether he was being sarcastic. Not many of the villagers smiled, which is in stark contrast to the resort staff, who call “Bula” and beam a million times a day. None of the very young or the very old smiled at all, which indicated to me that perhaps Fijian smiles, beautiful as they are, are there because they are paid to be. Or hopeful of payment. 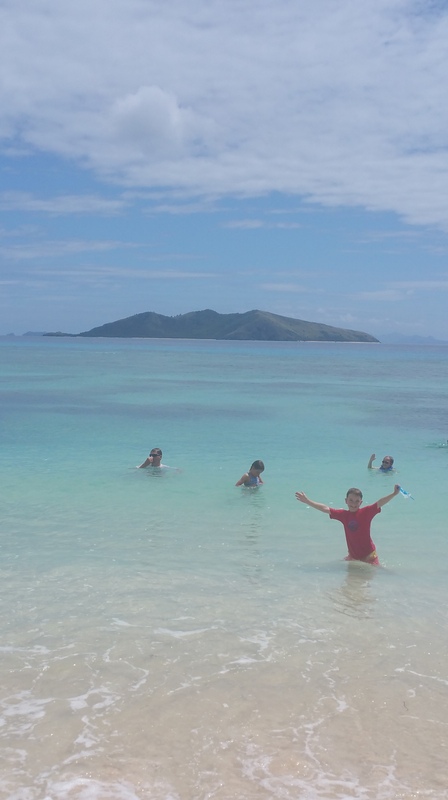 Tourism is now Fiji’s most lucrative industry. I’m not surprised. It’s easy to fall in love with this climate, these landscapes and seascapes. Easier still to fall for these gentle, freegoing people. But do they want to put their smiles on sale? It’s one thing for a country to capitalise on sugar cane, but quite another to make an easy buck from the good tempers of their humans. This makes me sad, but at the same time, I’m in love with, and envious of, the Fijian personality. Perhaps I’m overthinking it. Perhaps, when I feel ashamed that a warrior like man is flexing his muscles by clearing up my breakfast plates, he is grateful for his work. I talked to the Fijian woman who waxed my legs and she told me that she’s grateful every day for the English missionaries who came with colonisation and taught her forefathers not to be cannibals. She said that there is a national day of celebration for colonisation and the arrival of Christianity. I told her that the colonial experience of indigenous Australia is markedly different. With furrowed brow she asked how it went wrong. I said I didn’t know, because to tell all the ways it went wrong would go well beyond the leg wax time and well into destroying-holiday-feel territory. I’m back – it’s three days later, sorry Fiji time and all – and now I’m typing in the dark while the family sleep-breathe around me. We only have one day left of our holiday, and I’m not ready to leave. I wish that I was native to this island and had every right to stay. Actually come to think of it I wish I were native to somewhere, anywhere. Wow, that’s a pretty huge thought for someone on Fiji time with a pina colada and two wines under her belt. I’m not native to anywhere. I’m not endemic. I’m introduced. My descendants are English, Irish, possibly West Indian, yet I don’t belong to any of those countries. And in my home-place of Tasmania I’m painfully aware of not being native either. I don’t think I’m feral (although my children can be) and I don’t think I’m a pest (although when I see other non-native people of the pushy, loud-mouth, buffet, rude variety I could be convinced that I belong to a pesty, vermin-ish race). Whilst in Fiji I watched a group of Polynesian dancers as they demonstrated the traditional dances of their homelands. And I was jealous. I want a traditional dance (beyond the notorious Tassie two-step which was pioneered at the school socials of the 80’s), and I want to be able to do it. I want to be able to show it with pride to tourists visiting Tasmania. That’s never going to happen. Native dances of Tasmania – if they still exist after all their squashing – are not mine to show. I wish terribly that they were. There is foreign influence here in Fiji, of course. But native title is protected. No one can just take land from villagers; it is leased or bought after extensive negotiations. Things are done right. It’s as if the whole colonial transformation was/is done on Fiji time – thoughtfully and gently. There are two young Canadian, Seventh Day Adventist missionaries in the village. I took it for granted that missionaries are a thing of the past, but not here evidently. Rushing about, confrontation, yelling, effective rubbish collection and good coffee are other modern day afflictions/benefits that haven’t found their way to this Fijian island. I love it here, it’s beautiful and charming and I’m relaxed. The people are wonderful, the ocean is at its aquamarine, angel-fish best, the air is warm, the sun has shone and we are all well. As I lie on my sick-bed, gazing out at a spectacular Tassie day, I envy you the water and the swimming. I envy you the moment to write too, even though it was just a glancing moment. As always that moment produced words that glisten, sparkle and charm like a Killicrankie diamond. You also prompted me to wonder if I’m a native Tasmanian. But after travelling copiously overseas, and then living on the mainland for 15 years, at a week shy of 64 I do consider myself a native Tassie-person.